The town is built around a central square, dominated by a monument depicting a volunteer in the War of Independence. Brightly painted houses and distinctive shop fronts embellish the colourful and flower filled square. People from all walks of life have passed through this square, in the 1800’s Bianconi’s horses clattered through pulling stagecoaches to the stable on the north side of the square. During the famine people toiled in the workhouses erected on the southern side of the town. On the Tipperary road one comes to Gleneify Gorge, which furrows deep into the hills between rushing streams and pockets of woodlands. The gorge was formed by the south flowing melt water torrent from a pre-glacial lake. From the summit of the crevasse the scene sweeps down the Glen of Aherlow and up to the peaks of the Galtee Mountains. Mythology and Folklore surround this ancient site. The megalithic passage grave is thought to be the grave of Olill, an early King of Munster. According to the legend, the eloping couple Diarmuid and Grainne rested here in their flight from the angry Fionn MacCumhaill. The megalithic tomb and nearby Duntryleague stone cairn are in the care of Duchas – The Heritage Service. Just a few minutes from Galbally, stand the ruins of Moor Abbey founded in 1471 by Aunfrun O’Briain, a Franciscan. The Abbey has gone through sacking, burning and bombardment and only the ruins of the church along with part of the founder’s tomb remain. Galbally was as stronghold of the O’ Briens and a clan rally was recently held in the Glen of Aherlow. 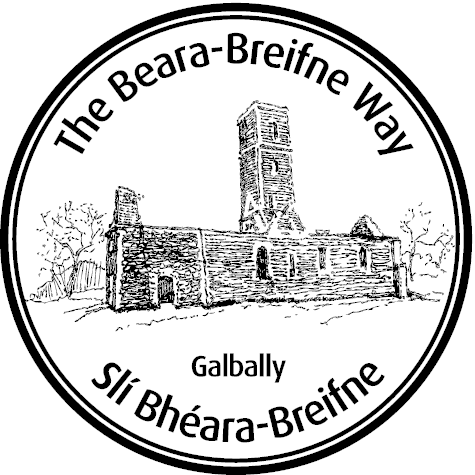 Galbally also forms a stage of the Beara-Breifne Way which is based on the historic march of O’Sullivan Beara in 1603.